At CMSRU, we believe that medical education should be a seamless continuum over four years, integrating knowledge of basic scientific concepts, early clinical experience and patient care, self-directed learning, teamwork, and medical and non-medical activities for the greater community’s benefit. The curriculum ties to the mission and vision of CMSRU, preparing students to be physicians, educators, and positive contributors to society. Over the four years, students are exposed to various cases and clinical settings designed to connect clinical relevance to basic science knowledge – beginning within the first few weeks of school, and frequently throughout the four years. Basic science knowledge is reinforced throughout clinical rotations. In order to establish these critical linkages, clinical faculty participate early in the medical school curriculum, working closely with basic science educators to tie basic tenets of scientific study to actual clinical scenarios. Coursework is divided into two phases: the “Foundation and Integration” (Phase I) that then allow for “Application, Exploration and Advancement” (Phase II). Phase I consists of two years at the end of which students will have developed the scientific background, knowledge, skills, and behaviors to immediately begin integrating that information into clinical practice. Phase II consists of the third and fourth years of the curriculum, during which students will be supported in the advancement of knowledge and the application to the clinical, social, and ethical aspects of care. Students graduating from CMSRU are expected to achieve a set of knowledge, skills, behaviors, and attributes that allow them to be successful physicians. These general competencies and related objectives are listed here. Students are expected to progress through a variety of milestones over their medical school careers to achieve these ultimate competencies. 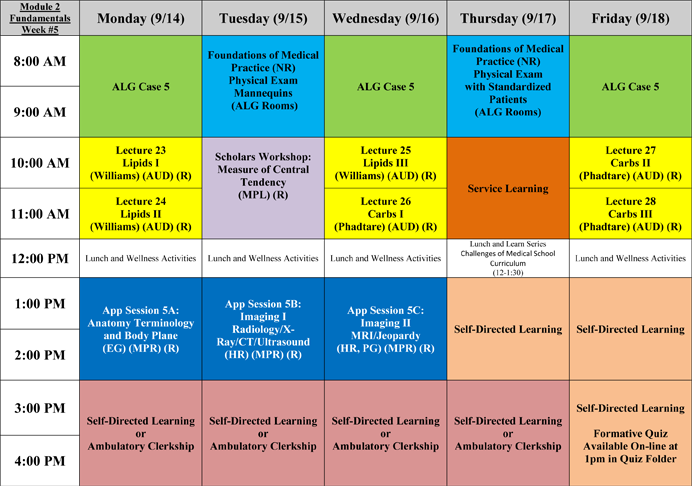 Below is a sample week of our first year curriculum, highlighting the integration of basic scientific principles, professionalism, and clinical care.